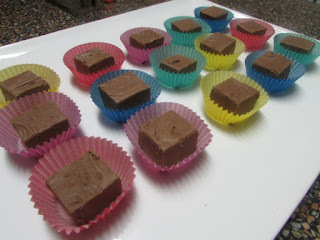 I came home from a trip to Tasmania having one cooking ambition and that was to find a simple but perfect chocolate fudge recipe. 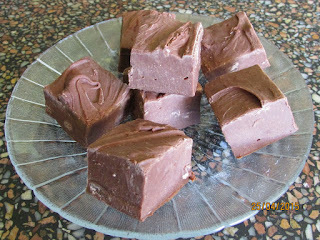 It took a couple of experiments but this version adapted from Repeat Crafter Me is the closest one to the perfect fudge that I fell in love with at Chudleigh, Tasmania. I wanted to make it quickly and yet ensure that it is silky smooth. I hit the jackpot with this combination. Try it. I am so convinced that you will love it too. 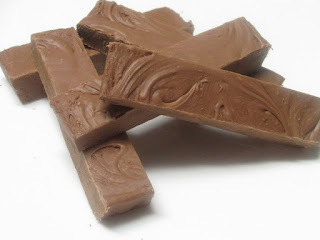 Place the chocolate, condensed milk, vanilla and butter in a microwave safe bowl & microwave for 2 minutes stirring once or twice, then zap in 15 second increments until the chocolate is melted. Be careful not to let it seize. Allow it to cool a bit (30 minutes) and then beat until the mixture is smooth and slightly thickened about 5 minutes. Carefully pour the mixture into a lightly greased tart lined with non-stick baking paper and smooth over with the back of a spoon. Set aside until set . A couple of hours at least, overnight if possible. Do you want to try different flavuors? Use different flavoured chocolate chips. Try some sieved rasbpberry couli! There are lots of different ways to add to this recipe! My 1st attempt: I first tried it in the slow cooker: as per repeat crafter me. The original recipe calls for 30 minutes in the slow cooker, mine had been going for 60 minutes and there was still tiny blobs of un-melted chocolate about the size of a pearl head on a pin or smaller. I was scared of it over cooking and took it out at this point. 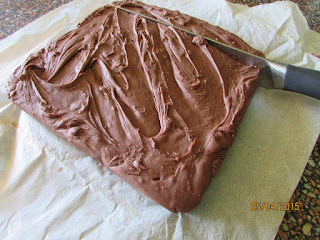 It was still delicious and had a little texture of minute chocolate bits in it which didn't detract from the fudge as a whole. Beaut flavour. My 2nd attempt: I decided to use the microwave and beaters as per above instructions. I used 100% milk chocolate. Beautiful texture - so smooth though I tried to 'pretty' the top and thus I disturbed the crusty skin so it didn't look as good. What flavours would you want in your fudge? One son wants caramel fudge and another says his wife adds crumbled honeycomb to hers and he loves it.